PETR SAIDL studied at the Conservatory in Pardubice near Stanislav Juřice and at the Franz Liszt High School of Music in Weimar with prof. Rolanda Zimmer, prof. Jürgen Rosta and prof. Monika Rostová. He actively participated in master classes (G. Crosskey, J. W. Duarte, H. Käppel, C. Cotsiolis, W. Lendle …). He has won a number of awards from national and international competitions. In 1990 he was included in the premium list of the Czech Music Fund. V r. 1993 began his pedagogical activities at the Pardubice Conservatoire, 2007 leads the guitar department. His students occupy the front seats in national and international guitar competitions (140 awards, 56 first prizes). He collaborates with music publishers, is regularly invited to jury guitar competitions, guitar festivals and workshops. In 2010 he became a member of the “D’Addario family”. 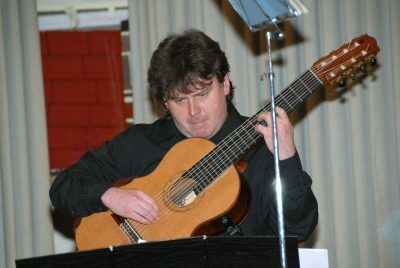 As a soloist, as well as a member of various chamber ensembles, mostly violinist Bohuslav Matoušek, violinist Milan Řehák, and also as a member of guitar quartet “Guitar4mation”, he performed in many European countries. Many films were created in cooperation with the Czech Radio, the radio and television station ORF. He made two solo CDs, another CD with viola M. Rehak and three CD guitar quartets “Guitar4mation”. He is the director of the Kutná Hora Guitar Project, which includes, among other things, “Guitar Night” and “International Guitar Biennale Kutná Hora” or “Young Guitarist of the Year”.